Greg Patterson told the council that a CID will help to improve Broadway. Diane Burnette of the Main Street CID joined Patterson for the presentation to the council business session. By now dozens of places in the city have Community Improvement Districts (CIDs), and the Broadway area in Midtown plans to join them. In a business session Thursday, the city council approved having a city attorney prepare an ordinance to make it happen. It was introduced hours later in the city council meeting. 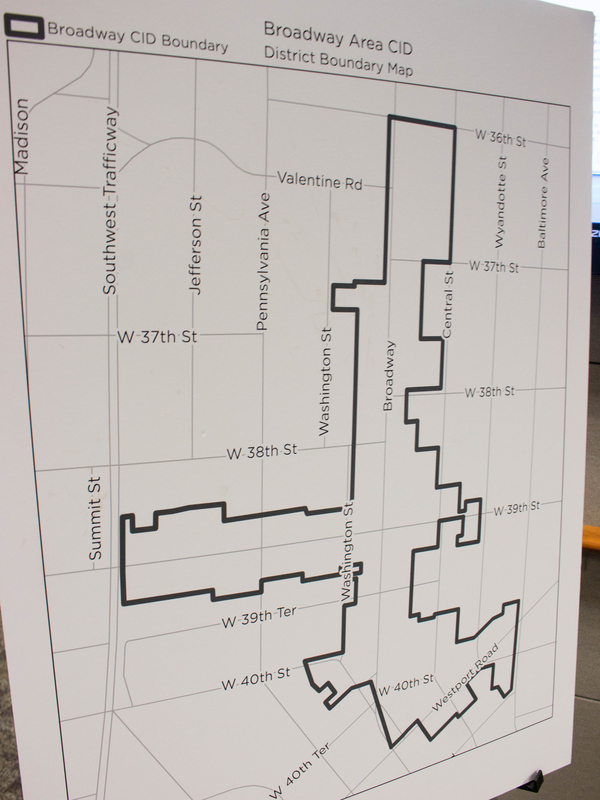 The boundaries of the proposed Broadway CID. The CID would allow an additional one-cent sales tax in the area, with the money it raises used for things like security, marketing and upkeep within the district. The boundaries are generally along both sides of Broadway from W. 36th Street to Westport Road, with branches extending west on 39th between Southwest Trafficway and Wyandotte Street, and on Westport Road to Baltimore. Similar CIDs on Main Street, 39th Street, in Westport and throughout the city have helped improve and maintain those areas. One citizen objected that the Uptown Theater and the Broadway Valentine Shopping Center are not included in the district, but councilmembers noted that their owner is seeking a separate CID. lol, This whole area needs a lot more than this. Broadway honestly has never looked worse. The substandard ash trees (many missing from the planting squares and let’s call them what they are:bushes, are too small to provide needed inner city shade), the broken down curbs and sidewalks all along the way to Westport Road, the gold and black spray-painted Hookah buildings that have popped up everywhere, tacky signage, gaudy colors. using raw lumber to build exterior decks on the fronts of businesses that look like suburban back yards. This area is ghetto and we should be asking why such an area as 47th between the Plaza and Troost received the facelift that it did a few years back (when it required very little in maintenance at the time) compared to high traffic areas like Broadway. I live off of this mess and look at it every day. We need form based building codes enacted and a WHOLE LOT OF infrastructure rebuilding before this area will begin to look as neat and upper middle class as it did once upon a time.